Okay, so this blog post is way overdue. I almost didn’t want to post it because I felt like my photos did not do the Great Barrier Reef justice. The beauty we experienced was indescribable and the memory will forever be with us. First, you can snorkel the Great Barrier Reef from different areas, but we chose Port Douglas. We flew into Cairns first, picked up our minvan rental, and made our way north for about one hour. We chose to stay at the Sheraton Mirage, which was a great choice, as it is ten minutes from the quaint little town in Port Douglas and the pier from which we departed for our snorkeling adventure. The resort itself is wonderful. It has large, lovely pools, friendly staff, and comfortable rooms. I’ll work on writing a review later. 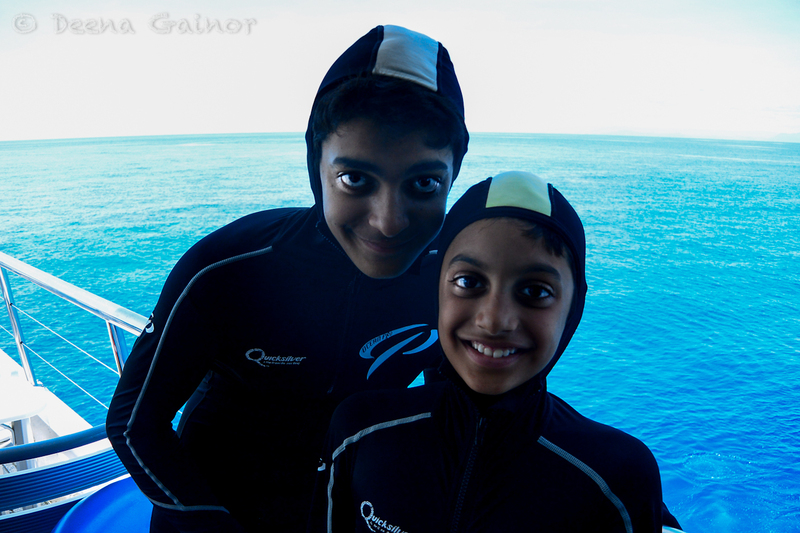 We chose to snorkel Agincourt Reef, the very outer edge of the barrier reef. It is one of the most pristine areas of the reef and offers great visibility, rich coral growth, and spectacular marine life. Quicksilver was our first choice of tour boats and we were not disappointed. The staff was friendly and helpful, and the whole process very efficient. We snorkeled three separate areas, and in between our snorkel dives, one of our guides spent time talking about the next dive location, explaining what underwater creatures we might see, things to be careful of, etc. Since we visited during the summer months, we most needed to be cautious about stings from the jellyfish there. Unfortunately, stingers can cause serious problems and can also be fatal. I didn’t realize the danger when I first booked our trip to the Great Barrier Reef, but learning about it made me a bit nervous, especially since we’d have the children with us. However, jellyfish and snorkelers have co-existed for years in the Great Barrier Reef, so we only needed to increase our knowledge and take proper precautions, which the staff of Quicksilver was quick to help with. They provided us with these attractive Lycra suits that had both hoods as well as hand coverage, to protect all body surface areas. Here are Ryan and Danny below, sporting their suits. Ryan and Danny sporting their Lycras! Once we had donned our suits, we were free to explore. We were amazed by what we saw. The colors were fantastic, but it was the size and variety of certain species as well as the coral and even giant clams that blew us away. Again I was reminded of the creativity of God as well as His sense of humor and the generosity of His nature, to allow us such a gift. I hope you enjoy what we were able to capture below, but the truth is, it is a hundred times better in real life!